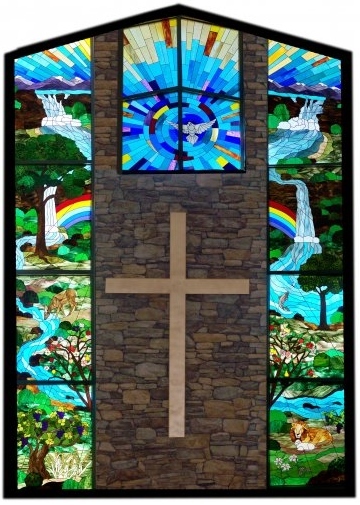 The rainbow design was enlarged and the magnificent windows were carefully installed in the sanctuary. On certain hours of the morning, the sun shines through so brilliantly that some people in the congregation need to wear sunglasses. The person who objected to the design has moved away, but I do hope someday she can witness a spectacular rainbow and be humbled and thankful. No agenda is necessary. Mom didn’t want or need to support or condemn the gay lifestyle or any lifestyle, for that matter. Instead, she chose to follow the teaching of Jesus and endorsed his commandment to “Love one another.” Her worn-out Bibles were covered with underlined verses, mostly about love and grace. A favorite passage came from the book of Hebrews in the Old Testament: “Keep on loving one another as brothers and sisters.” She followed that advice, often to her own peril as people took advantage of her generosity. Her funeral will be next Tuesday in the church, and I hope the sun shines through the stained glass and illuminates the place of worship that will be her final stop before the graveside service. If the sun doesn’t shine, maybe it will rain and then we’ll see a rainbow. Either way, we’ll know she helped design the day because she’s in good and powerful company. A beautiful window, a beautiful sentiment and a beautiful tribute. I will be watching for rainbows next Tuesday. The sun shines through your lovely stories of your mother. Thank you for sharing them. Next Tuesday, I will be sending lots of positive energy for a bright, full sky of sunshine that stretches through that beautiful window and fills the church with rainbow colors. And, in the event the clouds block the sun, I will pray the light shines up from the pews as people remember your mother and that rainbow leads right up to your mother. We will all be looking for rainbows as we think of you and your mother. So your mother’s light continues to shine through that beautiful stained glass window, and in the hearts of all who continue to love her. So lovely. The rainbow to me symbolizes hope and renewal and life after death. Your mother must have been extra special.